Visitors to Estonia are always amazed at the number and size of erratic boulders here. 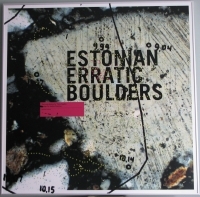 Indeed – over 90% of huge boulders (perimeter over 25 m or diameter over 10 m) of the Northern European ice area are located in Estonia, a bit over one hundred. The exhibition tells about our erratic boulders brought here long ago by the continental glacier. The boulders have been a blessing and a nuisance to peasants who have brought offerings and expected miraculous healing from them. There are innumerable legends about the boulders as well. Packaging: 2 plywood transport boxes with handles and metal edging, of 80cm (length) x 80cm (height) x 27cm (width). Make enquiries about the exhibition from the Estonian Institute’s Tallinn office (estinst@estinst.ee).